Enso Theatre Ensemble is a 501 (c)(3) non-profit dedicated to artistry inspired by the philosophy of the Enso symbol. ​We produce ensemble-based professional theatre, and offer unique educational opportunities in an environment of mindfulness and well-being. We seek to shift the paradigm of the “starving artist” by providing artists with the tools they need to find a healthful balance between work and life -- a balance represented by the "enso" symbol. Our vision is to create a space in the Portland community which serves as an "Enso-Arts Hub" for local artists. 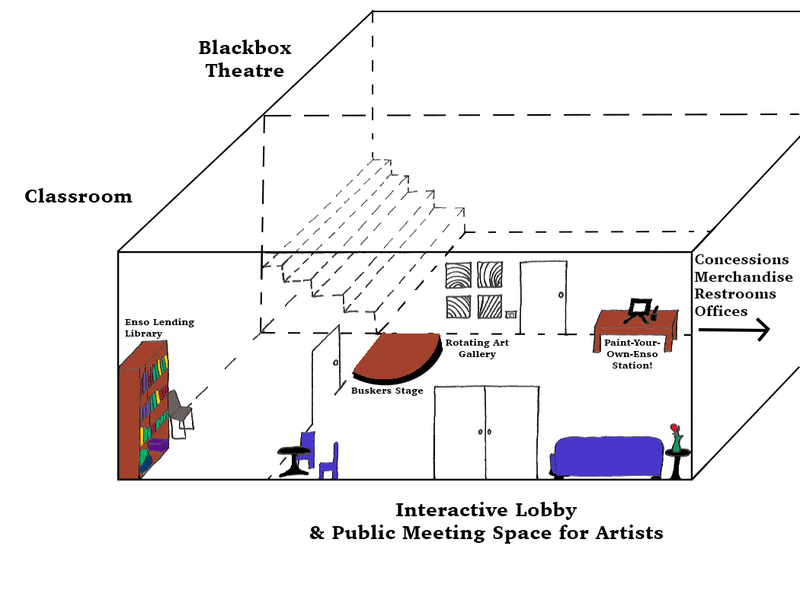 Our Blackbox Theatre will have at least 100 seats, with flexible arrangements, and will serve as the performance space both for our professional programming and the final performances of our students. Every professional show will have students involved in some capacity. Our Lobby area will be designed to encourage interaction and conversation. A Rotating Art Gallery will feature a new artist every three months. One corner of the room will demonstrate how to paint an enso, and provide supplies to try it. A small stage will feature musicians, poets, actors and more before every performance. Sets of index cards on each table will pose Conversation Starters to incite discussion before and after each show. We hope to partner with a for-profit company that aligns with our philosophy and interests. For example, a for-profit tea company would run the Lobby space as their tea shop during day hours, and operate as our Concessions vendor during production runs. If you would like to learn more, email us at ensotheatre@gmail.com. ​﻿We need your help to make this community space a reality! If you're excited by our vision, please check out our Patreon. Patreon is a crowdfunding site we are using to help us fund the things we are already creating. You pledge a few bucks per month, and we make incredible things happen. You can opt out at any time. We will have a "Patreon Station" at our shows where you can ask us questions, find out more, and become a Patron right there!